Along with millions of others, we have been enjoying the news BBC series of Poldark, adapted from Winston Graham's books. 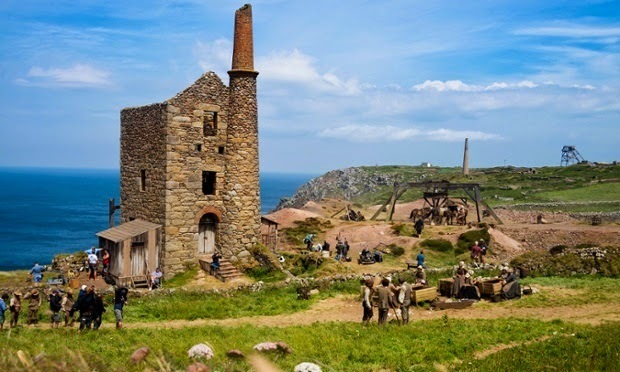 Set in late 18th century Cornwall, the plot follows Ross Poldark's attempts to make his derelict tin mines a success, as well as his relationship with his servant girl Demelza. I am not sure that the series would have such a great following if Ross was involved with coal mining in the north of England. It is the glorious Cornish coastal scenery which makes the show so watchable, although Amanda and Barbara would no doubt argue that the leading actor is also a contributory factor. Location managers couldn’t resist the rich mining heritage of the stretch of west Cornwall coast linking Botallack and Levant (see posting of 2nd October 2014). The perilously perched Crowns Mine engine houses, built in the mid 19th century, double as the Poldark family mine Wheal Grambler. Botallack was given World Heritage Site status in 2006 and is part of the Cornish Mining World Heritage Site. The iconic ruins are the most photographed and painted engine houses in the county (posting of 30th May 2010) and such inspiring coastal locations had an impact on the Poldark cast. "So much of the piece came alive when we were filming in Cornwall and everyone found their character in the outdoors," said Eleanor Tomlinson, who plays Demelza Carne. "Demelza is very connected to the landscape," added Eleanor. "I also love the countryside and just enjoyed exploring all the different coves and beaches and the endless beautiful blue water, it was so gorgeous. It is such a peaceful and relaxing place." 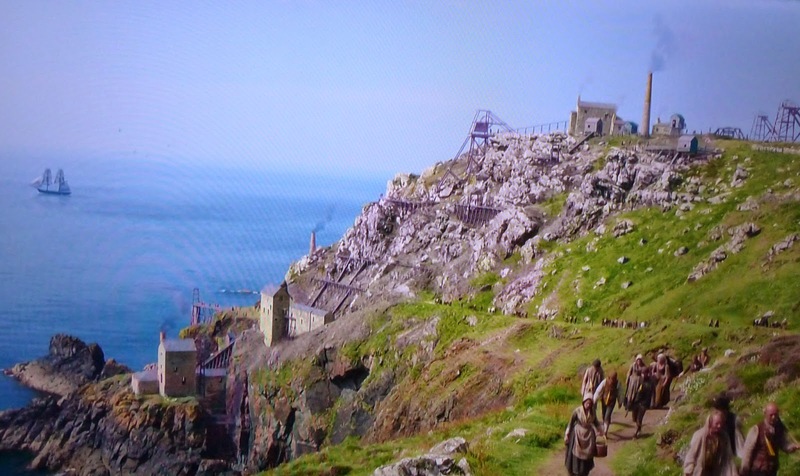 I couldn't resist pausing the TV to take the photo below, showing how digital enhancement has brought the Botallack Mines back to life in vivid colour. It is clear that the template for the computer generated images was the late 19th century photo of the mine in its heyday. A little further westward from the Botallack Mines is the West Wheal Owles engine house, which, suitably dressed up, played a major part in the Poldark series as the fictional Wheal Leisure, the mine which Ross brings back to life. This is a wonderful stretch of coastline which I would strongly recommend you visit if you are interested in Cornwall's unique mining history. I called in at the mineral processing laboratory of Wardell Armstrong International (WAI) this morning, only 9 miles from the MEI Office. WAI has extensive experience of ore testing and has a comprehensive client base, having undertaken metallurgical testwork for clients in over 50 countries on samples from areas including Europe, Africa, Russia, Canada and Australia. As a result of client demand for a current copper porphyry project in Kazakhstan WAI has purchased a SAGDesign test mill from Comminution '16 sponsors Starkey & Associates of Canada. All this week, Jenna Hedderson of S&A has been at the lab near Truro to commission the mill with process engineer Ben Simpson. The mill is the SAG equivalent of the Bond Mill for steel ball mills, and the design, based on John Starkey's equations for mill scale-up, has proved very succesful worldwide, and certainly comparable to the JK Drop Weight Tester, also used to design full scale SAG mills, the SAGDesign mill requiring much smaller sample sizes while providing a wealth of data. WAI has had a Drop Weight Tester since mid 2013, so can now offer both industry standard solutions for laboratory scale testing, obviating the need for pilot-scale testwork. This is Jemma's first trip to Europe, so it is a great shame that she has seen very little of Cornwall during this commissioning period. She has been a metallurgist with S&A for nearly 3 years, after graduating as a chemical engineer from Lakehead University, Ontario. WAI has 20 mineral processors on site, virtually all graduates from nearby Camborne School of Mines. If I had seen this a week today I would have assumed it was an April Fool's joke, but at the annual meeting of the American Chemical Society in Denver Dr. Kathleen Smith, lead scientist at the US Geological Survey suggested that human waste could be processed to extract metals, including gold, silver, copper and vanadium, flushed down lavatories every year. In Britain alone this could account for as much as £500 million worth of values. She said that gold has been identified in waste from sewage treatment plants at levels which, if found in rock, would be worth mining. The tiny particles of metal are believed to come from everyday items such as hair care products, detergents and food or drink. Many find their way into the body and are excreted. They then end up in sewage treatment plants where they are concentrated in leftover biosolids. Organic biosolids are used as fertiliser on fields while the rest is incinerated or buried. What do you think- worth pursuing or just a load of crap? Carbon Capture and Storage: more research, or none at all? There is no doubt that the requirement to reduce emissions of CO2 will have a marked impact on the minerals industry, particularly on the viability of new ventures. In last week's The Times, Matt Ridley argues that carbon dioxide is not the most urgent problem facing humanity, compared with war, extremism, poverty and disease. "But most presidents, popes and film stars think it is, so what is the best way of solving the problem?" The science and technology committee of the House of Lords (on which Ridley sits) told the government in a recent report on the resilience of the electricity system that it has not sufficiently informed the public about the “trilemma” facing policymakers. We cannot — in the present state of technology — make the electricity supply low-carbon, resilient and low-cost all at the same time. Decarbonisation is not achievable if politicians wish to restrain energy prices. Which leaves plan B: to continue using fossil fuels but extract the carbon dioxide from power station exhaust by “carbon capture and storage” (CCS). There have been many research articles on CCS published lately, some in mineral processing journals, such as Minerals Engineering which recently published a special issue on the Accelerated Carbonation conference (ACEME 2013), which also aimed at promoting mineral carbonisation in the context of CCS and Carbon Capture and Utilisation.When the topic of CCS comes up, I, like Matt Ridley, admit to being unsure whom to believe. On the one hand there are those who say: it is ready to go, it solves the problem, what are we waiting for? On the other, those who say it’s a costly white elephant going nowhere. Ridley argues that the first problem is that the process reduces the efficiency of the power station. "A normal coal-fired power station runs at about 35 per cent efficiency — that is to say, a bit more than a third of the heat energy in the steam gets turned into electricity. Adding CCS means that the efficiency drops to maybe 26 per cent. The cost correspondingly goes up substantially, as do people’s electricity bills." The British government has been dangling a £1 billion carrot in front of the energy industry to get CCS going but delays and cancellations are affecting CCS around the world. Given that electricity is only a small part of the energy system, if CCS is to solve our problems it has to roll out to not just every coal and gas power station on the planet, but to smelters, refineries and all operations generating large quantities of CO2. Ridley concludes that there is no way to meet our self-imposed decarbonisation target without bankrupting the country. It’s not more effort and political will we need; it’s more research. In response to this, Frederick Bellringer, a Fellow of the Royal Society of Chemistry, felt that Matt Ridley was wrong in concluding that more research on CCS is required. He argued that carbon capture is a relatively straightforward but expensive technology. Storage, however, requires that liquid carbon dioxide has to be conveyed by pipeline to a suitable hole in the ground where it has to remain for ever. He said "In the UK we have apparently spent oil wells where this may be possible. Even in the UK the logistics of such an operation are formidable, but for the rest of the power stations throughout the world the logistical, political, technical and financial problems would be insurmountable." He concludes by saying "We do not require more research on CCS. We require a firm decision from our politicians that it is nonsense." I know very little about this subject, so I do not wish to take sides in the argument. I would, however, like to have the opinions of those of you are involved with CCS: those who are researching this area and those of you who are affected by the need to implement such technology to reduce your carbon emissions. Last year, while walking home from an MEI Conference function, I was treated to a beautiful sight of a full moon over Falmouth Bay. This morning at 0930 GMT the new moon, in virtually the same position, obscured the sun in a 90% solar eclipse, which was unfortunately partly obscured by heavy sea mist. This is not the first eclipse that we have seen in Falmouth. 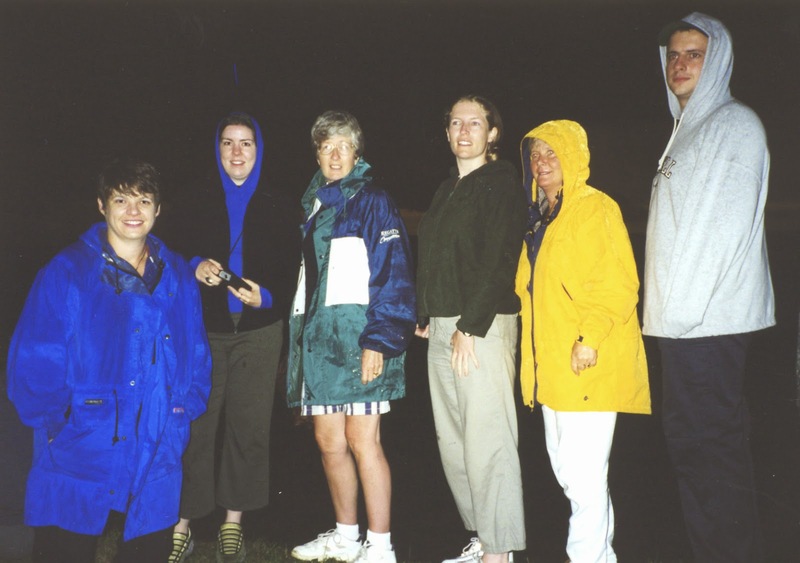 In 1999 thousands of people flocked into Falmouth, which was the only town in Britain to witness a total solar eclipse. Unfortunately the display that day was slightly disappointing as thick clouds obscured the sun but the sudden illusion of night was a memorable experience. 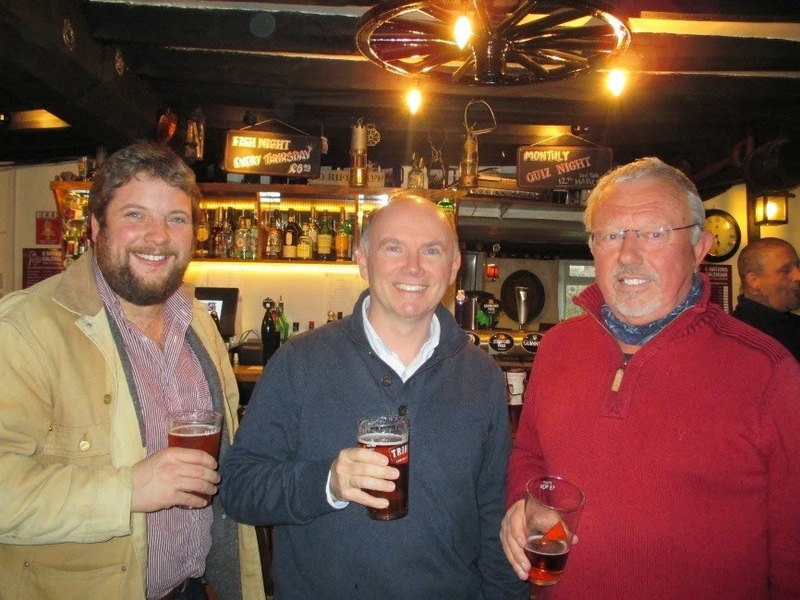 The Cornish Mining Sundowner was held this evening for the first time at the Thirsty Scholar pub in the ancient town of Penryn, the site of the University of Exeter in Cornwall campus which includes the Camborne School of Mines. It was very well attended, with a number of CSM MSc Mining Geologists, and biohydrometallurgists Paul Norris and Dave Dew in attendance. Also good to see Comminution '16 sponsor Grinding Solutions represented by Nick Wilshaw, Kathryn Hadler and Simon Bailey. Granted a charter in the year 1216, Penryn is one of the oldest towns in Cornwall, preceding its now larger neighbour Falmouth by some 200 years and in the 15th Century it was a major port. The Thirsty Scholar is one of Penryn's listed building, set in the historic heart of the town, on a site that has been a brewery or a hostelry for more than six hundred years. 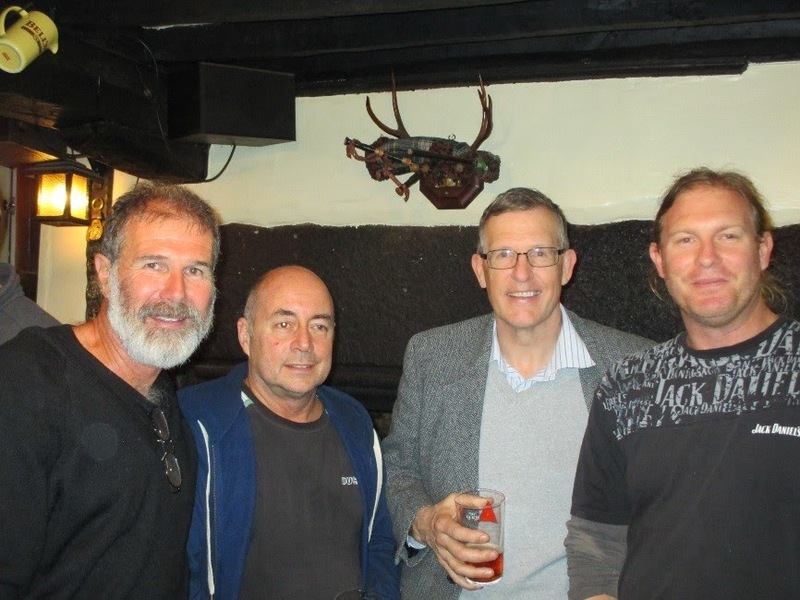 Earlier in the month 25 mining and related personnel attended the Devon Mining Sundowner at the Miners’ Arms, Hemerdon Village. Those attending included Wolf Minerals personnel from the Drakelands operation, the former AMAX Hemerdon project manager Roger Craddock and Sibelco project engineer James Tupman. Sandy and Elizabeth Lewis-Gray are perhaps the most well-known and respected husband-and-wife team in minerals engineering. They are the co-founders of Gekko Systems, which is a world leader in gold processing technology, as well as the design, construction and operation of energy efficient modular plants. Prior to her involvement in the mining sector, Elizabeth Lewis-Gray worked in stockbroking and strategic planning and her qualifications include a Bachelor Degree in Economics, and a Masters in Business Management. Romance blossomed when Elizabeth was working in stockbroking in Melbourne and Sandy was managing a gold mining operation in regional Victoria. They married and continued their careers in different locations until the advent of their first child. On finding herself in a small country town with no career opportunities and married to Sandy, who had invented an “amazing” new gravity separation device, Elizabeth decided to take up the challenge of marketing and selling this product - the InLine Pressure Jig (MEI Online). A small research and development grant was applied for and approved from the government, a mortgage on the house extended, and thus Gekko was created in mid-1995 and now has its head office in Ballarat (Victoria) and offices in Perth, Vancouver, and Johannesburg. Sandy invented his first jig at 17 years of age in the Curnamona Basin in South Australia’s outback, where he learnt his craft in the field with "a brilliant man", Fred Hughes. With over 35 years of experience in mining and mineral processing operations, Sandy is now Technical Director of Gekko Systems. Since founding Gekko he has rejuvenated the art of continuous gravity separation and he has become a world leader in low energy and pre-concentration flowsheets (gravity and float), as well as concentrate leaching flowsheets for the gold and silver sector. He invented Gekko’s patented systems including the InLine Pressure Jig, InLine Leach Reactor, G-Rex Resin Exchange and the Python Processing Plant. His inventions are breakthroughs in the field of mineral processing, with over 600 installations at mines in 43 different countries. The products and systems are now breaking into the coal and polymetallic sectors. Sandy continues to invent new products and flowsheet designs. In recent years his main focus has been on improving plant economics incorporating technologies/flowsheets which focus on overall plant productivity improvements in energy, reagents, and maintenance/operations. He feels that to maximise the benefits of the new flowsheets it is necessary to have a completely integrated approach and possibly the most exciting transformation will come through the total downstream benefits of fine crushing up front for optimum liberation ahead of any further process. Sandy is a recipient of the prestigious Clunies Ross Award, Australia’s pre-eminent award for scientists, technologists and innovators. Other awards he has received include the AusIMM Mineral Operating Technique Award, the Ernst & Young Entrepreneur of the Year Award and, most recently, the Victorian Premier’s Design Award in 2010 for the Python low height modular plant. I asked him what have been the highlights in his career, and it is apparent that one of his most satisfying achievements has been the introduction of intensive cyanidation for the recovery of gravity gold concentrates into the gold industry through the development of the InLine Leach Reactor. 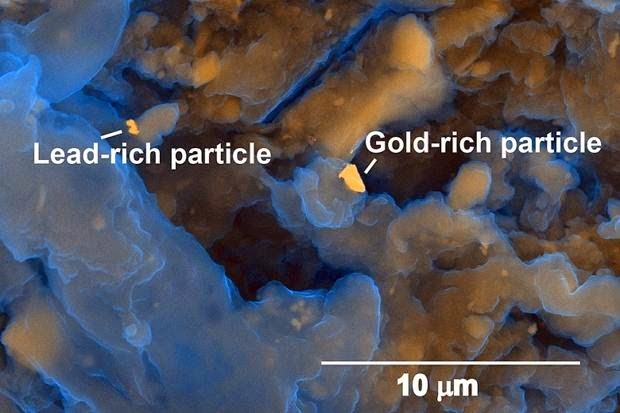 This technology is now used in most gold mines with gravity circuits in the world. He is also proud of the design and development of the Python and its installation at Kloof in South Africa with a commissioning period of only 6 weeks. Another success which he is justifiably proud of is the application of VSI (vertical shaft impact technology ) to improve pre-concentration outcomes through focus on liberation characteristics. This was used originally as a stop gap for HPGR but Sandy now believes it will become a standard metallurgical tool for those trying to optimise liberation. He also mentioned his ‘hero moments’, meeting Alban Lynch (in conversation 11 August 2014) and the late Arthur Keats, who worked on flotation developments in Australia. Also the late Professor Andre Laplante (MEI Online) from McGill University - a world leader in gravity separation research with whom Sandy “co-presented, fought, agreed, and laughed on many AJ Parker gravity workshops together”. Elizabeth Lewis-Gray is now Chairman and Managing Director of Gekko Systems and is currently Chair of Austmine, as well as Chair of Austmine’s Strategy Sub-committee. She was a member of the Australian Federal Government’s National Precincts Board and after eight years, recently retired from the Innovation Australia Board. She was inducted into the Australian Businesswoman’s Hall of Fame in 2000, is a Fellow of the Financial Services Institute of Australasia (FINSIA), and has won several awards including the Warren Centre’s Innovation Heroes Award. More recently Elizabeth was appointed by Industry and Science Federal Minister to Chair the METS Industry Growth Centre in Australia. I remember talking to Elizabeth at the IMPC in Brisbane in 2010. She enthused about a new project that she was initiating on eco-efficient comminution and, to be honest, I was a little sceptical of it ever getting off the ground. How wrong I was proven to be. She created the Coalition for Eco-Efficient Comminution (CEEC) from nothing to bring together information on energy efficiency in comminution. 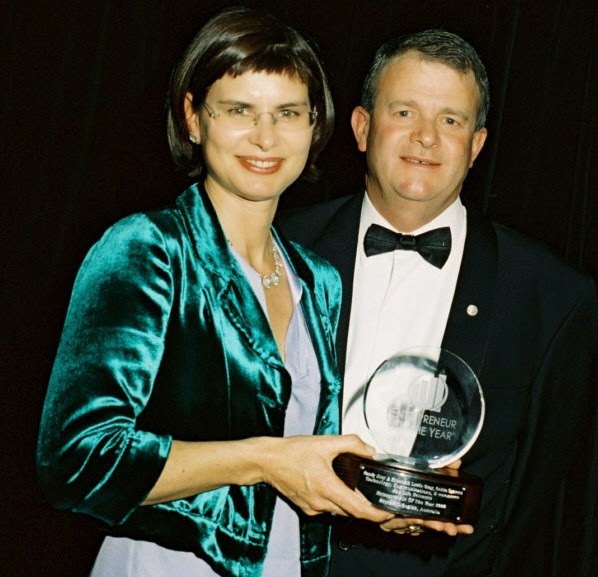 Under her leadership (Tim Napier-Munn refers to her as “one of the great movers and shakers”) CEEC has the capacity to have a meaningful global impact on energy consumption in mining and has recently been awarded the 2013 Mining Magazine Editor’s Award. With board members from around the world, CEEC now highlights important issues and facilitates debate in comminution energy efficiency, and MEI is proud to be involved with CEEC and its role as Industry Advocate to Comminution ’16. CEEC is now in the capable hands of EO Sarah Boucaut and Chairman Joe Pease (posting of 15th January) and is making an appreciable difference in educating the industry, especially at board level, for a very low cost investment. Elizabeth finds this very satisfying and shows why marketing is a skill set undervalued and much required in the mining industry. The establishment and impact of CEEC is an example of how someone with a non-technical background can add value and bring holistic industry change. Elizabeth was recently named by the Canadian Institute of Mining (CIM) Magazine as one of mining’s top twelve “names to know - 12 characters whose energy, imagination and impact are catalysts for change in a tumultuous year” - for her work in founding CEEC. Elizabeth’s current project is Austmine where she has taken on the chairmanship of the Australian peak industry body representing the mining, equipment, technology and services (METS) sector. One of the key roles for Austmine has been to undertake a comprehensive survey with the help of the Australian Federal Government which has identified that the industry has a turnover of AUD$90billion or a significant 3% of Gross Value Added in the economy (compared with mining at 10% GVA). The sector has a strong innovation platform and significant opportunities to improve productivity in the mining sector. Improving productivity, mining and supply sector relationships and accelerating the innovation cycle are key areas of focus for sectorial improvement. I asked Elizabeth what have been the highlights in her short but illustrious career. She particularly enjoys travelling all over the world to various mining operations and in June 2014 travelling to Canada and the U.S.A. with a small 20-strong Australian delegation led by the Prime Minister, the Hon. 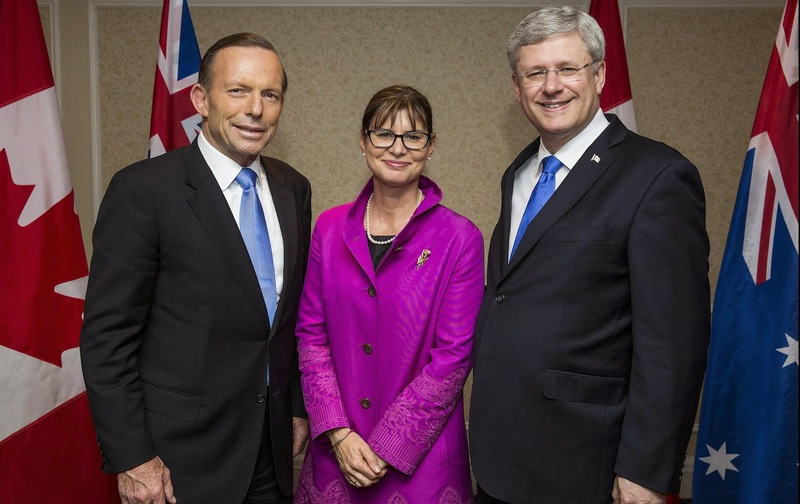 Tony Abbott, and Minister for Trade and Investment, the Hon. Andrew Robb. Highlights have also included leading government mining and METS missions to China and Canada. She says that she is inspired by mining executives who have the courage to understand the ability of innovation to advance their business and engage in the process from the top down, using strong management and process to deliver results. She is passionate about innovation and marketing. “There are so many brilliant technical ideas in the mining sector but we are missing the links between concept and application - the capacity for technical people to convert their ideas into meaningful narratives that include addressing financial impacts in a way that speaks to boards and senior executives”. She feels that Tim Napier Munn (in conversation 12 May 2014) deserves a special mention for his technical brilliance and personal commitment to creating better outcomes for the good of the industry. 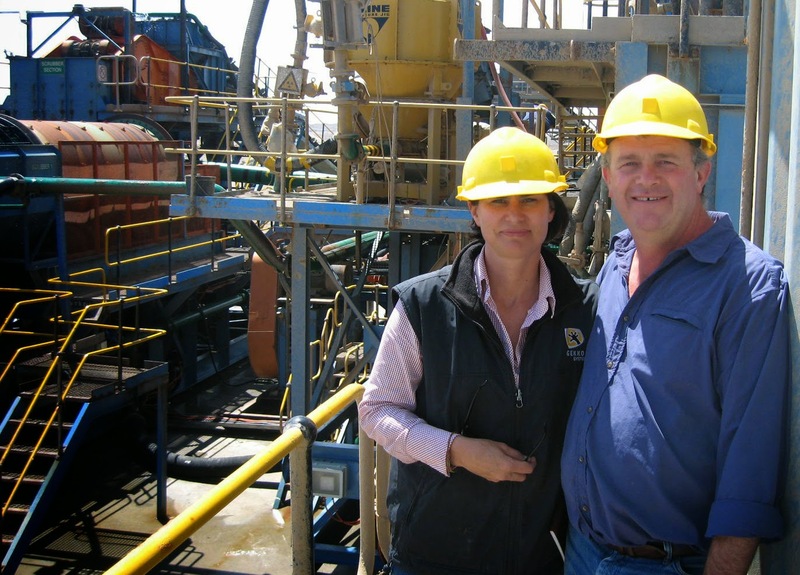 In 2013, both Sandy and Elizabeth were independently nominated for the inaugural International Mining Innovation Hall of Fame, but in different categories. They are a remarkable duo and I consider myself fortunate to know them so well, and to be able to share our recent conversations. Around 250 current and past students and staff of the Camborne School of Mines descended on Falmouth for last night's CSM Annual dinner. Past students had flown in from all over the globe, from as far as Australia, for what is always a great occasion, which invariably throws up a few surprises. The first person I met in the Falmouth Hotel bar was Ray Manser. Although we swap Christmas cards it is 30 years since we last saw Ray and his wife Sally. I supervised Ray's PhD project on shaking table modelling in the mid-80s, and he is now Senior Systems Engineer with Fairport Engineering in the north of England. Joe Bayah and his wife Glenda had flown in from Guyana. Joe, a 1980 graduate, is currently working on a magnesite project in Guyana. It was good to meet the new Director of CSM, Kip Jeffrey (MEI Online), pictured below with CSM Trust Director Tony Batchelor. After an excellent dinner, Kip gave his maiden speech as Director, highlighting the current healthy status of CSM and exciting plans for the future. Despite being a graduate of 'the other place', the Royal School of Mines, the guest speaker, Russell Clark got a fine reception. Russell is managing director of Wolf Minerals, who this summer will be opening the Drakelands tungsten-tin mine a few miles east of Plymouth, which will become the first new metals mine in England since the Wheal Jane copper and tin mine in Cornwall reopened for business in 1971 (posting of 10 July 2014). “This mine has the potential to be the biggest tungsten mine in the western world and, if we just build it to the base case, it will be the second biggest,” said Russell. Planning permission was granted to the site in the late 1980s, but the end of the Cold War scuppered the mine. The former Soviet Union and the United States released enormous stockpiles of tungsten, which is used in weaponry and machinery because it is one of the hardest naturally occurring substances. Tungsten was mined briefly in the area during the two world wars. He said that there had been little local opposition to the mine. “People think that as you’re on Dartmoor, there must be protests. I have never seen support like this.” The company has asked local parish councils to allow it to operate seven days a week, a step that would improve the economics of the mine. Sparkwell, one of the local parishes, has already voted in favour. “We’re lucky we are in an area that has a mining history,” he said. “A lot of local people are used to seeing a pit, used to seeing a quarry, and they recognise it’s good for the economy.” Wolf is planting 40,000 trees to protect views and has built three “bat hotels” to create havens for the endangered animals. The local population certainly appear to be buying in: Wolf recently started advertising for equipment operators and about 900 candidates applied for 40 jobs. Among those the mine has already recruited is 1980 CSM graduate Charlie Northfield, the manager of the processing plant. He left Plymouth in 1981 to work in a diamond mine in Sierra Leone and spent the next few decades working on overseas mining projects, most recently in Malaysia. "I have been coming back to the UK regularly over the years, but to come back and be able to stay has been fantastic,” he said. 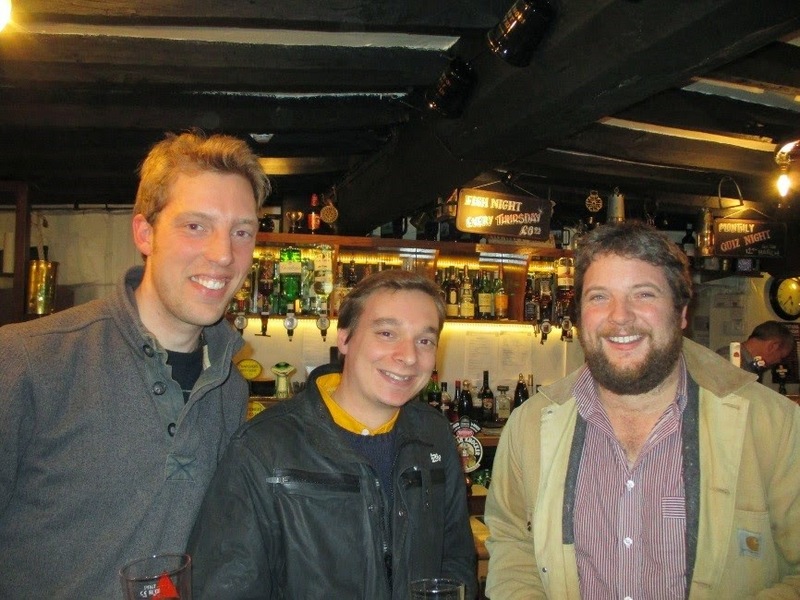 Charlie will be back in Falmouth again in May to present a paper on the status of the processing plant at Physical Separation '15. It was a great night, with excellent company and food, and I thank Claire Yelland, secretary of the CSM Association, for her tireless efforts in organising this annual event. What a wonderful town Falmouth is! Last weekend Falmouth's popular community policeman, PC Andy Hocking, died suddenly at the age of 52. He had built up an army of friends during his time as a neighbourhood beat manager, and today thousands of people 'walked his beat' along the main street to Event Square in his memory. A moving and fitting tribute from the people of this Cornish town to a local hero. Barbara and I were privileged last night to be invited to the reunion of CSM's class of 1980, which was held at Falmouth's beautiful The Cove restaurant. 1980 was one of my favourite years at Camborne, as many of the graduates that year were involved with my sporting activities, particularly squash, cricket and sub-aqua. They were a fun bunch, and now 35 years later, with a few grey hairs, they still are, as was very evident last night. Many thanks must go to Felicity Wilshaw of Grinding Solutions, for organising the reunion dinner. •The reserves of each economic ore available in India. •Scope of process flowsheet, material balance flowsheet, drawl of equipment specifications, equipment flowsheet, etc. •Milestones to be kept in mind in execution of a commercial beneficiation plant. •Estimation of water, power, site selection for a process plant. •Basis for estimation of equipment and capital costs of the plant. •Estimation of production costs and profitability. •Environmental aspects affecting mining adversely. The book is published from Zorba Publishers, and I invite your feedback on this new text. 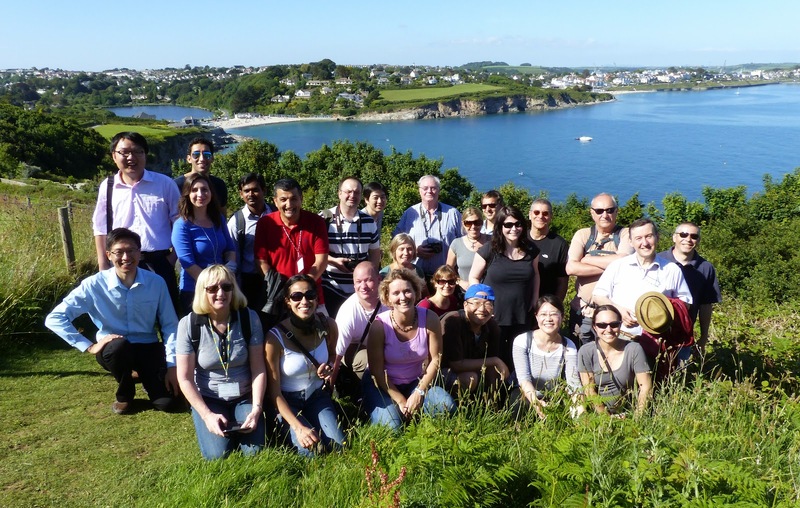 If you are attending one of MEI's Falmouth conferences, you should seriously consider spending a few extra days in Cornwall, one of the world's most beautiful areas and of great historical interest to anyone connected with the mining industry. 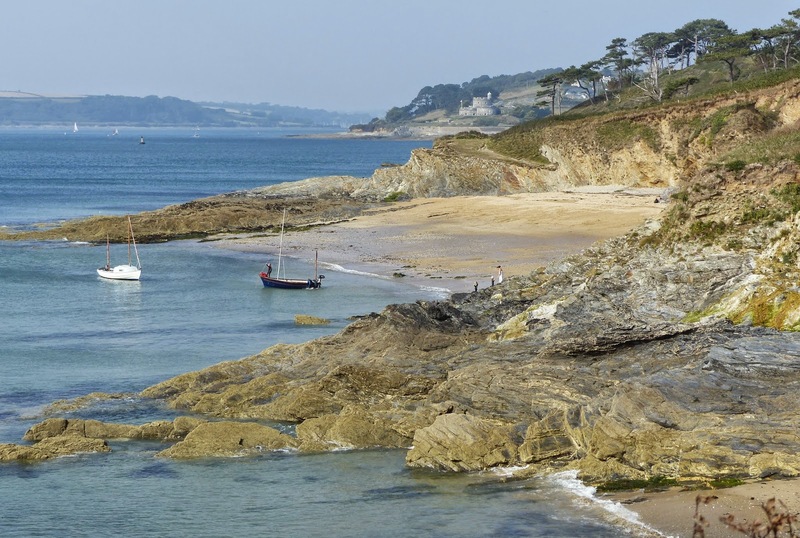 If you are travelling by car, then check out our Cornwall section, and you will be able to explore this stunning county, maybe using our suggestions as a guide. 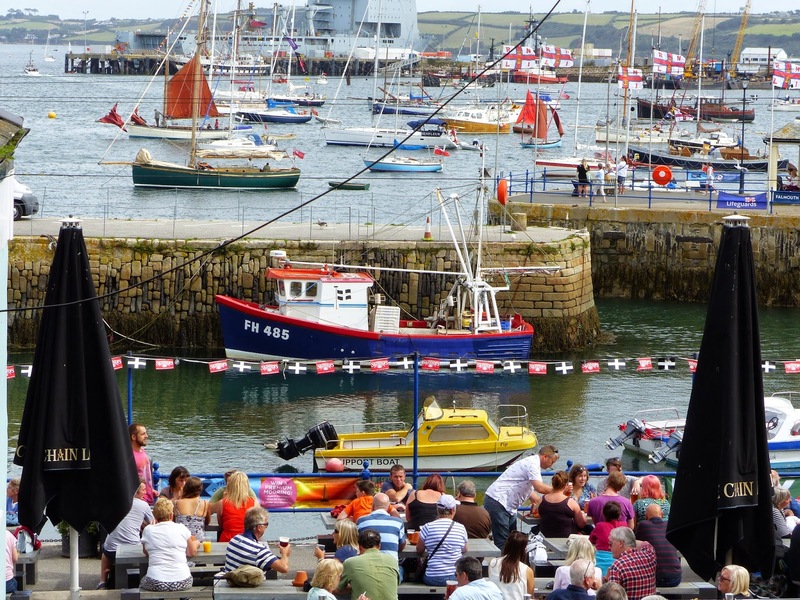 If, however, you take our advice on travelling to Falmouth by train, then here are ten things which could keep you very occupied for a few days, with no need for a car. English history is colourful and bloody, and none more so than in the Tudor era. Falmouth lies on the estuary of the beautiful River Fal and perched on the headland only 15 minutes walk from the MEI conference venue is the Tudor fort Pendennis Castle, built around 1540 as one of a series of castles running along the south west coast of England on the orders of England’s most famous and grotesque kings, Henry VIII, who most people know had 6 wives, two of whom were executed, including Anne Boleyn, the mother of another famous monarch Elizabeth I. In order to marry Anne Boleyn, Henry had to renounce Catholicism in order to divorce his Spanish queen Catherine of Aragon, so the threat of invasion from catholic France and Spain was imminent. The castle is well worth a visit. Set high on the headland it offers panoramic views of Falmouth Bay, and looks across to its sister castle across the river at St. Mawes. See posting of 4th April 2012 for more information. 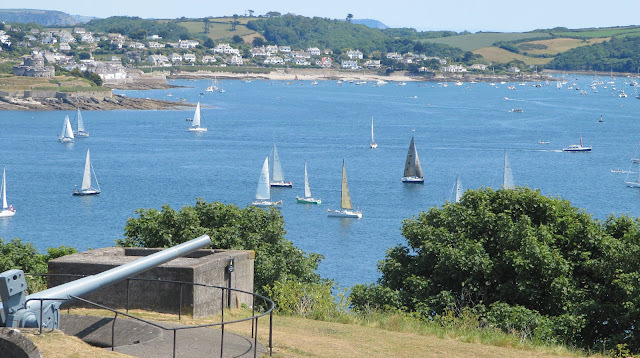 This whole day outing from Falmouth's Prince of Wales Pier will not disappoint you, as it offers some of the finest coastal scenery in the whole of the county. See posting of 20th September 2014 for full details. Another whole day outing, this time using the train from Falmouth to Penzance. Take the branch line from Falmouth to Truro and then the mainline express to Penzance. After an hour or so in this historic city, the birthplace of Sir Humphrey Davey, take the mainline train again, but alight at St. Erth and then hop on the branch line train to beautiful St. Ives. Full details on the posting of 26th May 2014. You can take the branch line train (as in 3) to Cornwall's capital city Truro, but if the tides are right take the boat trip from Falmouth's Prince of Wales pier, up the River Fal to the city centre. It has an eclectic offer of art galleries, bars, restaurants, cathedral and the Royal Cornwall Museum. A city steeped in history and impressive architecture, there is plenty to see and do. Whether you are keen to shop, dine, visit the gardens or simply meander through the Georgian streets we are sure you will enjoy your visit to Truro. Falmouth's Event Square has some great restaurants, and is the home of the Maritime Museum. From here you can also take a dolphin and whale watching boat trip via Orca Sea Safari. 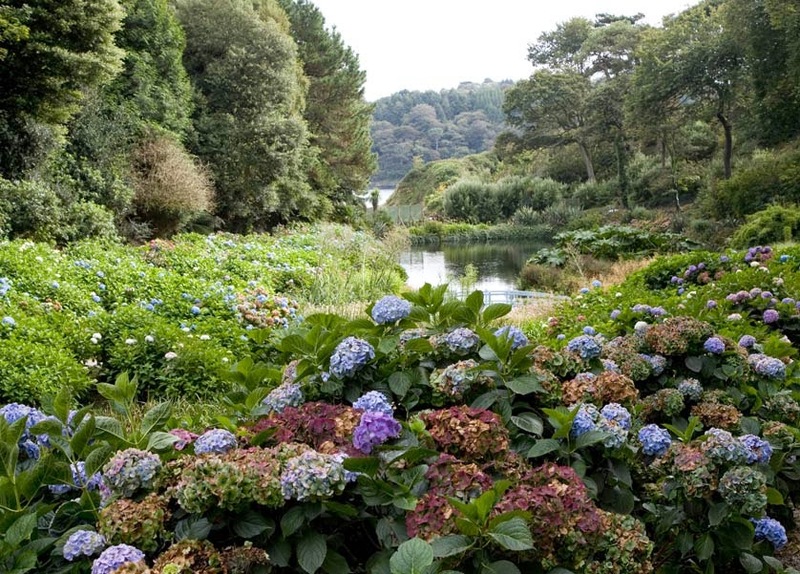 Cornwall is famous for its gardens, but Trebah on the Helford River is one of the best. Take the no.35 bus from Falmouth Moor, spend some time in the gardens, maybe have lunch in the restaurant then walk the beautiful stretch of coast path back to Falmouth. 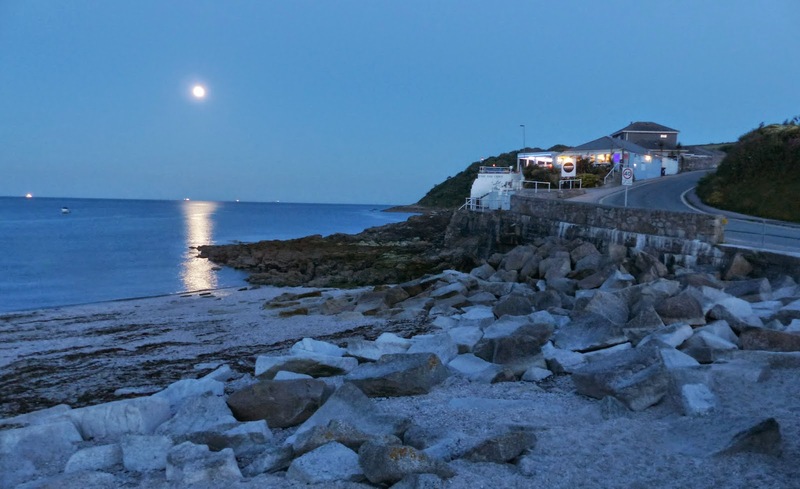 The section of coast path from Pennance point to Falmouth town is an optional evening walk during MEI Conferences, where we end up with real Cornish Ale in one of Falmouth's oldest pubs. 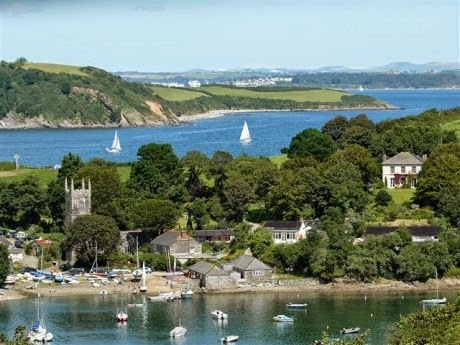 Falmouth lies between two rivers, the Fal and the Helford, and boat trips to the beautiful Helford River and the Helford Village leave from the Prince of Wales Pier, and pass by Frenchman's Creek, made famous by Daphne du Maurier's eponymous book and the Hollywood film. 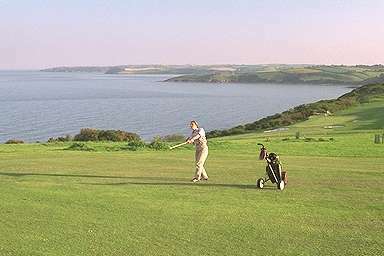 Falmouth golf course is stunningly located on the cliff top overlooking Swanpool Beach and Falmouth Bay, and the club house is about 20 minutes walk from Gyllyngvase Beach and the conference hotel. If you have not brought clubs you may be able to rent at the club, if not I can fix you up with a set or two. If you are into watersports, then Falmouth Bay is an ideal location. It has some of the best scuba diving sites in the UK, particularly on the Manacles Reef (more info in the posting of 8th March 2012). If you would like to hire a windsurfer, sailing dinghy, kayak or paddle board, then head to Swanpool Beach only a 10 minute walk from the conference hotel. If you just want to chill out and do very little, then Falmouth is also a great place to do this! If the sun is shining, doze on one of the lovely sandy beaches. Or stroll into town and eat at one of the many fine restaurants offering a wide variety of ethnic dishes. Browse the many art galleries on the main street, and stop for refreshments in one of the many pubs. These 10 suggestions are obviously very subjective, based on my many years in Falmouth. I am sure that Amanda and Jon will have different ideas, so I look forward to hearing their views and those of any of you who have had experience of this beautiful part of the world. The history of mineral flotation is a record of over a century of impressive innovations, especially in the development of flotation chemistry and chemicals, the principles of their action, their manufacture and the role they play in sustaining efficiencies and productivities even as the quality of ores declines and the severity of the challenges increases. One of the oldest manufacturers of flotation chemicals is Flotation '15 sponsor Cytec Industries, Inc. of USA, who celebrate their centenary this year. In 1915 Cytec, then American Cyanamid, entered into mining and introduced the AERO® brand, a technology to extract gold and silver from low‐grade ore. Since that time, Cytec has introduced hundreds of new technologies and has been granted on average 40 new patents per year. Today, one of the key challenges facing the industry is improving the efficiency of metal and mineral separation and extraction in ores that have reduced metal content. Another challenge is the need for localization of plants and refineries across the globe. As the global awareness shifts and new mines get started in new countries, Cytec has increased its global presence by expanding plants in India and Canada and continue adding professionals across the world with unparalleled expertise in supply chain and local service requirements. Perhaps the most well known member of the Cytec research team is Principal Research Fellow Prof. D.R. Nagaraj. 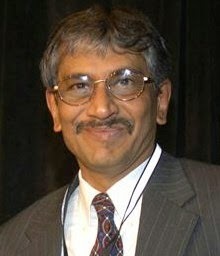 "Nag" as he is popularly known, started his career at Cyanamid in 1979 after his doctorate from Columbia University, and held various positions in Cyanamid/Cytec over the years, but never far from science, research, and education which are his passions. To commemorate Cytec's centenary, Nag will present a keynote lecture at Flotation '15: Evolution of Flotation Chemistry Research: A Century of Innovations and the Emerging Challenges. He and his co-author, Raymond Farinato will emphasize the major innovations that have directed progress on this subject, especially those innovations that have positively impacted industrial scale applications. An analysis will be given that organizes the evolution of flotation chemistry and reagents into four historical and one emerging period. As in many other technology areas, flotation chemistry research and development have reached a plateau in the face of mounting industry challenges related to water and energy consumption, decline in the ore quality, and environmental aspects. Breaking out of this plateau will require several necessary steps, including more detailed, holistic understanding of practical systems, development of novel technologies and chemical schemes, and finally adoption by mineral processing practitioners. Success of developing novel technologies will be greatly improved when we can confront the chemical complexity in flotation systems. This in itself is one of the grand challenges in the emerging period. Nag and Raymond will outline some directions to achieve this goal.